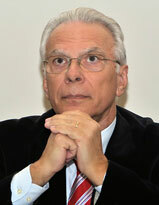 Georgios Marzelos (Director of the Postgraduate Program of Theological Studies of the University of Neapolis Paphos) was born in Thessaloniki in 1948. He studied Theology, History and Philosophy at the Universities of Thessaloniki (1966-1971), Athens (1971-1975) and Heidelberg (1976-1979). He holds a Ph.D. degree from the Department of Theology of the Aristotle University of Thessaloniki (1983) with the mark “Excellent”. He was Lecturer (1983-1986), Assist. Professor (1986-1990), Associate Professor (1990-1993) and Professor (1993-2015) at the Department of Theology of the Aristotle University of Thessaloniki, teaching the courses of History of Orthodox Theology and Dogmatics. He taught as Visiting Professor at the Universities of Munich (1995-1996) and Bern (summer semester 2007, winter semester 2009 and 2011). He served as Governor of Mt. Athos (1994-1996) and Director of the Patriarchal Foundation of Patristic Studies (2009-2017). On 25-8-2008 he was elected as member of the International Academy of Religious Sciences (Académie Internationale des Sciences Religieuses) seated in Brussels. He was a member of the Central Committee of the World Council of Churches (2006-2013) and since 2013 is a member of the World Council of Churches’ Faith and Order Commission. He represented the Church of Greece at the 9th and 10th General Assembly of the World Council of Churches in Porto Alegre, Brazil (2006) and in Busan, South Korea (2013).